After leaving Redding, we watched a partial solar eclipse from the parking lot of a Trader Joe’s, while also watching a live stream of the full eclipse from Oregon on my phone. Since traffic going into the path of totality wasn’t so bad the previous night, we wondered if we should have gone for it, especially after seeing how cool the full eclipse looked on the live feed. We had a lot of regret, and promised ourselves to be more persistent the next time we set out to do something. 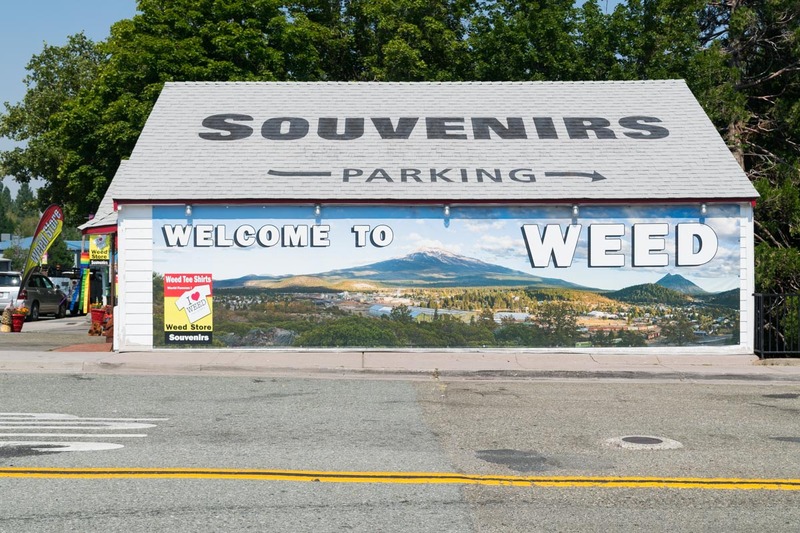 Driving towards the Oregon border, we stopped at the town of Weed. There’s a lot of shops selling t-shirts and souvenirs capitalizing on the town’s special name. As we drove into Oregon and closer towards the path of totality, we started seeing more and more cars going the opposite way. Eventually it became bumper to bumper traffic for cars heading back to California. Surprisingly, all the gas stations were still open and running as normal. In the end, I think none of the end-of-the-world scenarios came to be. 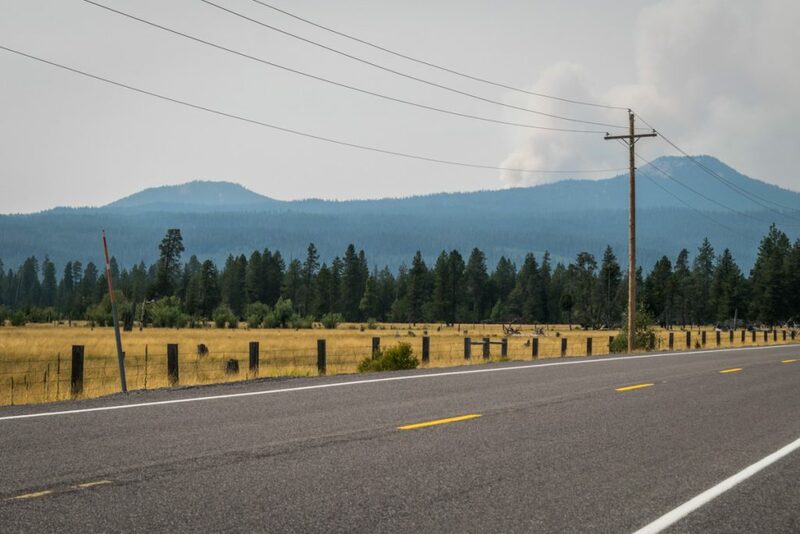 As we approached Crater Lake National Park, we noticed a lot of smoke coming from that area. We quickly checked online on the park’s official website and realized that there was a big fire going on. 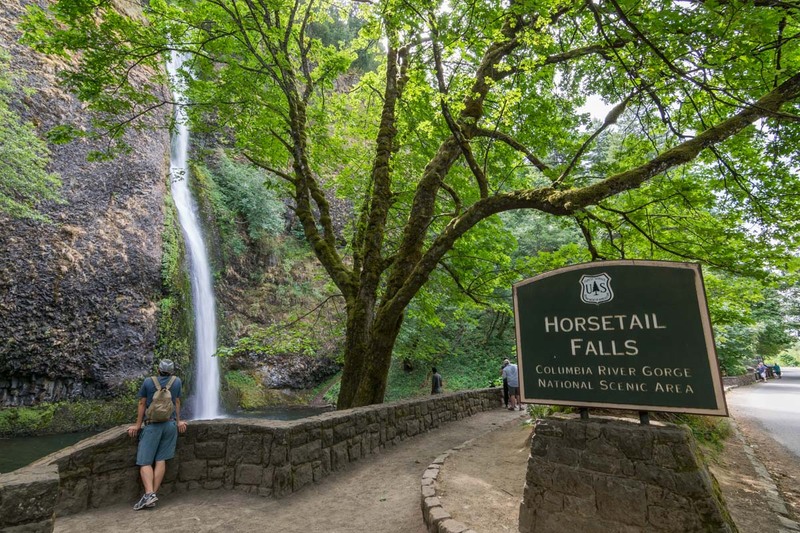 From that day on we would always check online before going to a National Park. Doing this saved us from a long drive to Glacier National Parka couple of weeks later, when it was closed due to another fire. We were only minutes away from the entrance to the park, so we thought we would go in and check out the situation. The air was smoky, but not too bad. We saw a lot of Pacific Crest Trail hikers walking on the side of the road and around the visitor center. We sat in the car for a while and admired them from a distance. It surprised me how everyone had small ultralight backpacks. Back when I hiked the John Muir Trail in 2009, probably only around 10-20% of hikers had ultralight gear. 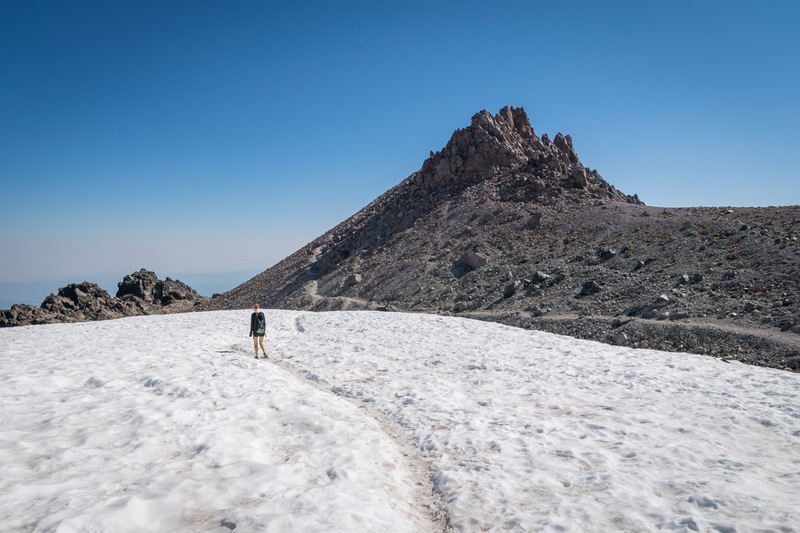 This is a different crowd though, as the PCT is about ten times longer than the JMT. Looking at them made me want to do long distance hiking again. 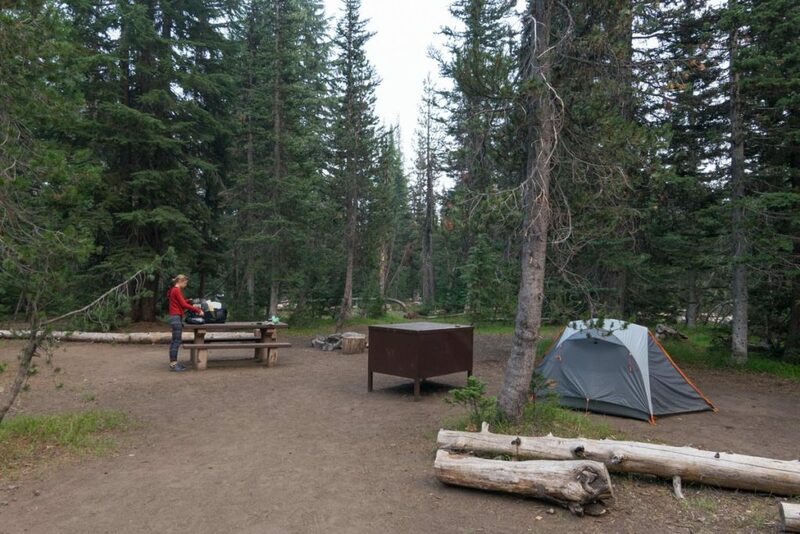 We checked into the huge but also empty Mazama Village Campground. We would soon understand why it was empty. 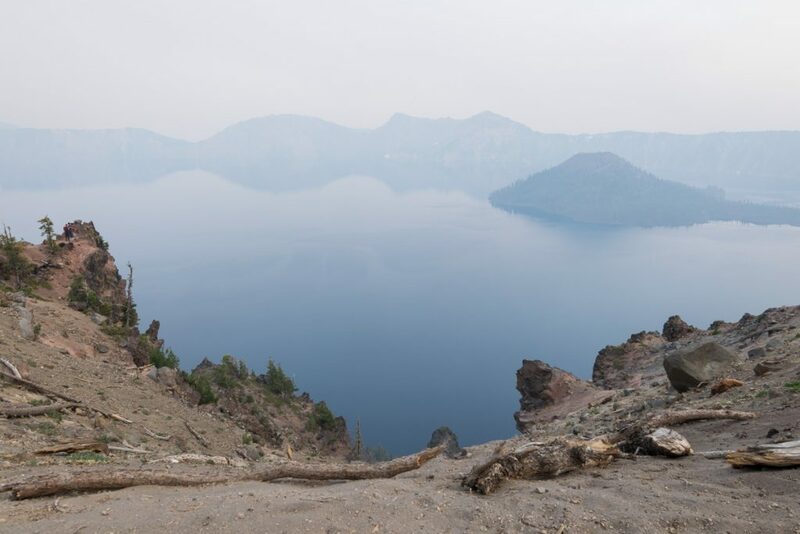 This is a very small National Park centered around Crater Lake, a big volcanic crater filled with deep blue water. On this day though, the smoke in the air really limited its visibility. We drove around the road that circles the lake, and it was the same disappointing hazy view from each lookout point. Not wanting to inhale a bunch of ash into our lungs, we didn’t do any hiking either. With nothing else to do, we left the next morning instead of staying a second night. Peter, whom we stayed with in Eureka just a few days before, joined us for that night. He had decided to leave Eureka at 3am that morning and drive to the path of totality on the Oregon coast. He said the drive was traffic-free the entire way, which made us regret even more not having done it ourselves. His original plan was to camp with us that night, but seeing how smoky it was, he decided to drive home after sharing dinner and a campfire with us.